Licensed medical marijuana producer Aurora Cannabis is looking to raise up to 230 million Canadian dollars ($185 million), a sum CEO Terry Booth called “the largest bought deal financing” to date in the Canadian cannabis sector. 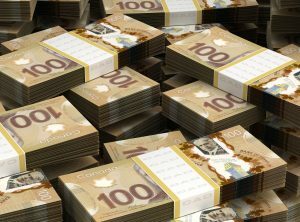 That will be on top of about CA$600 million in new financing the Alberta-based producer raised over the past 13 months, Executive Vice President Cam Battley told Marijuana Business Daily. Purchased a 17.62% stake in the privately held producer Green Organic Dutchman Holdings worth CA$55 million. Bought 682,400 shares of rival cultivator CanniMed as part of a takeover attempt, including Friday’s purchase of 24,600 units. Inked a deal to build “Europe’s largest” medical cannabis facility in Denmark. Signed a strategic partnership with Namaste Technologies. Under the bought-deal transaction, the company said in a news release that a syndicate of underwriters has agreed to purchase 200,000 convertible debentures at a price of $1,000 each. The proceeds would total CA$200 million. Aurora also granted the underwriters an option to purchase an additional 30,000 convertible debentures for additional proceeds of CA$30 million. The offer is expected to close around Jan. 31. Aurora and CanniMed are traded on the Toronto Stock Exchange under the ticker symbols ACB and CMED, respectively. Namaste is traded on the Canadian Securities Exchange as N.